One of Vogue’s proclaimed top 10 American designers in high fashion and bridal is coming to Diamond Bridal Gallery. This May 4th through the 13th, don’t miss your chance to see this luxury 2018 line, and, on weekends, complimentary champagne. 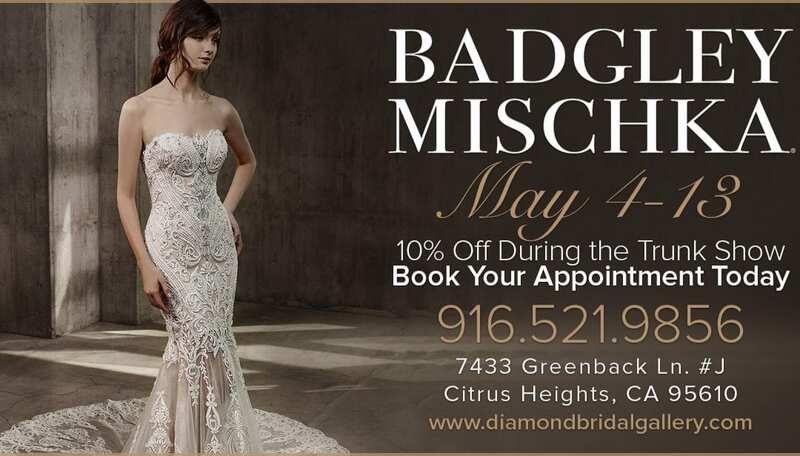 Badgley Mischka may be known for its couture runway fashion, but the designer shines just as much in their glamorous bridal collection. From full, jaw dropping skirts to alluring sleek mermaid silhouettes, this collection is bold, brilliant, and breathtaking. A gold bodice pairs with a black ruffle tulle skirt for the unconventional bride. Low illusion backs pair with Georgian lace and delicate trains. A ruched bodice and off the shoulder sleeves stand apart with a low illusion and lace back, and touches of sparkle. In every gown, you’ll find luxurious detailed stitching and beautiful necklines. In order to view the collection, you must make an appointment in advance.